One of the questions we ask of our new clients is how they hear about us. Many of them found us by doing research – mostly online – for natural and effective ways to help improve their pet’s current health problems. Allergies, digestion, arthritis, cancer – these are all pet health problems that we come across on a regular basis (and it’s interesting to note that these are common diseases in humans too!). One health problem that comes up quite often is canine kidney disease. A main player in the body’s filtration system, your pet’s kidneys provide a major function in removing toxins in the bloodstream and eliminating them through the urine. The kidneys control the water, salt, and mineral levels in the body and help with calcium absorption. They also produce a hormone called erythropoietin (EPO) that helps with red blood cell production. 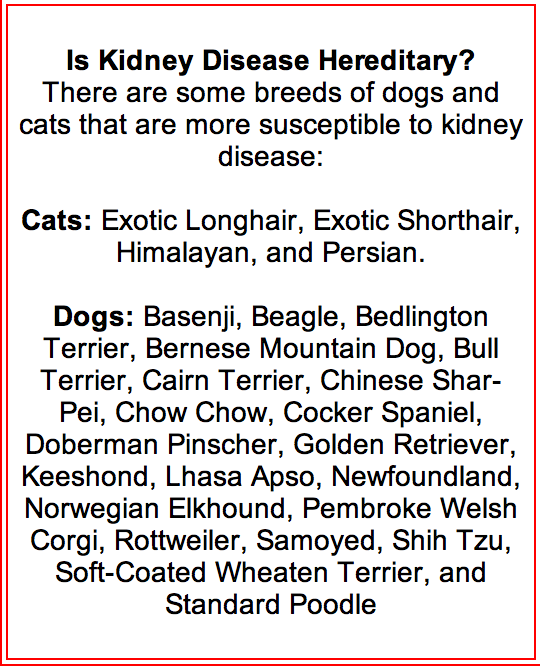 So you can see why the health of your pet’s kidneys is so important. When the kidneys start to fail, your pet will feel the need to drink more water in order to flush out those excess toxins in the body that the kidneys are not filtering out. Over time, even excessive intake of water won’t help remove those toxins thus, much more serious issues will arise. Because the symptoms listed above can be the result of many other possible health issues, a blood or urine test may be necessary in order to diagnosed kidney disease. There are two types of kidney failure in dogs and cats: acute and chronic. Acute kidney failure happens suddenly and aggressively. Bacterial infections, poisoning, and even kidney stones or other urinary blockages can cause acute kidney failure. When acute kidney failure is suspected, immediate veterinary care is necessary because this is a life-threatening situation. Luckily the majority of instances of acute kidney failure can be treated – if caught in time. 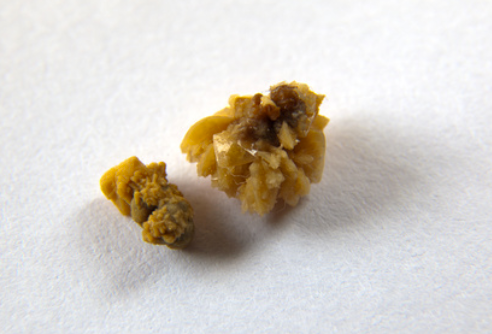 The picture above shows a close-up view of two kidney stones. An increase concentration of minerals in the urine combined with too low of an alkaline level in the urine is the perfect breeding ground for the formation of stones. Chronic kidney failure is much slower in progression and most common in older animals. Unfortunately, by the time your pet starts to show signs of chronic kidney failure, the damage has already been done and there is currently no cure. Besides kidney failure, kidney stones (or Nephrolithiasis) are another pet health problem we come across quite often. Nephroliths are clusters of stones or crystals that form either in the kidneys or in the urinary tract. These clusters create blockages in the urinary tract, which are very painful and life threatening if not treated right away. Cats: Exotic Longhair, Exotic Shorthair, Himalayan, and Persian. There are many steps that responsible pet parents can take in order to help decrease the chances that their pets develop kidney disease. As always, diet plays a major part in disease prevention. Eliminating all heat-processed diets (dry, canned and semi-moist pet foods) and treats as well as foods containing artificial flavors, dyes, and preservatives will help to reduce the amount of toxins the body is exposed to, thus reducing stress on the kidneys. Instead, feed a complete and balanced, species-appropriate raw food diet that contains raw whole foods, no artificial ingredients, and no grains. A raw food diet contains a high level of easily absorbed water content with minimal toxins, which is perfect for good kidney health. Some veterinarians will prescribe a low-protein diet for pets suffering from kidney disease. The reasoning behind this is that the body produces urea (waste) when it digests protein so in order to alleviate stress on the kidneys, they will often recommend a low-protein diet. Our co-founder and raw pet food diet guru, Robert Mueller calls this the “protein diet controversy.” He states that there is actually little to no scientific proof that a low-protein diet is the best way to go. In fact, in his 35+ years consulting pet parents on the proper raw food diet for pets with kidney disease, he has found that a diet comprised of mainly bones and raw food (BARF Diet) which is high in protein actually helps entice the animal to eat and provides them with a much better quality of life. A raw protein-based diet is much easier for your pet to digest and contains a much higher level of essential nutrients which allows the body to heal itself better, naturally. Speaking of water, make sure to provide your pet with a clean source of filtered or distilled water. Tap water contains chorine, lead, bacteria and nitrates that your pets – and your family – should not be consuming. That’s why health experts recommend that pregnant women, children – and yes our pets – should instead opt for filtered water to minimize toxins and eliminate harmful contaminants from being introduced into the body. If your pet is suffering from kidney disease, make sure to add an omega-3 supplement to their dietary routine. Fish oil has been known to help slow the progression of this disease. Fish Oil (omega-3) – the most important supplement for kidney disease and prevention. 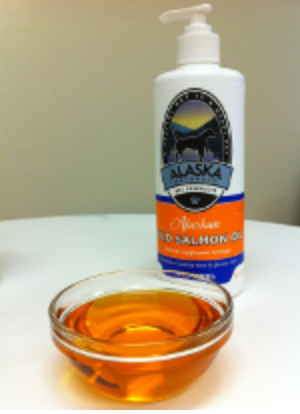 Fish oil (especially wild salmon oil) have been know to slow the progression of kidney disease in pets and people. Coenzymes Q10 (CoQ10) – A natural antioxidant, CoQ10 has been shown to help humans with kidney and heart problems. 1.5 mg per pound of your pet’s body weight each day should be sufficient. For those of you who read our informative pet health articles, you’ll notice this common theme regarding the health of our pets: the foundation to a healthy, happy pet is a natural raw food diet, clean filtered water, wholesome pet supplements and as little exposure to harsh chemicals, toxins, and medications as possible. So steer clear of over-vaccinating your pet, using harsh flea and tick treatments, and avoiding foods and treats containing ingredients that are hard for our pets to digest (such as grains, artificial flavors, artificial colors, and preservatives). These are the best practices to follow to help your pet stay healthy, active, and vibrant for as long as possible! “What Your Kidneys Do.” American Kidney Fund. American Kidney Fund Inc., 20 Dec. 2007. Web. 11 March 2013. “Kidney Problems In Dogs.” WebMD. WebMD LLC, n.d. Web. 11 March 2013. “Canine Kidney Failure: Causes, Treatment and Prevention.” Healthy Pets With Dr. Karen Becker. Dr. Joseph Mercola, 4 Nov. 2010. Web. 11 March 2013. “Chronic Kidney Disease and Failure (CKD, CRF, CRD).” Washington State University College of Veterinary Medicine. Washington State University, n.d. Web. 11 March 2013. Pierson, Lisa A. “Feline Cystitis and Bladder/Kidney Stones.” Feline Nutrition Education Society. Feline Nutrition Education Society, 28 April 2009. Web. 11 March 2013. Hines, Ron. “Kidney and Bladder Stones in Dogs and Cats.” 2ndChanceInfo.com. 2ndchanceinfo.com/Ronald Hines 2013., n.d. Web. 11 March 2013. “Kidney Stones in Dogs.” PetMD. petMD LLC, n.d. Web. 11 March 2013. “Kidney Failure (Uremia) Symptoms in Cats.” WebMD. WebMD LLC, n.d. Web. 11 March 2013. “Renal Failure, Acute (Canine).” Petside.com. NBC Universal Inc., n.d. Web. 11 March 2013. “Kidney Disease.” The Cat Practice PC. The Cat Practice PC, n.d. Web. 11 March 2013. Sawyer, Molly. “Raw Food Diet For Dogs With Kidney Failure.” eHow.com. Demand Media Inc., n.d. Web. 11 March 2013. Mueller, Robert. 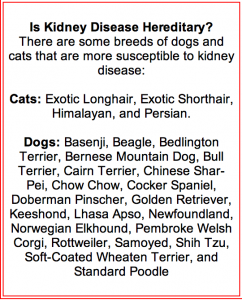 “Kidney Disease In Dogs.” BARF World Blog. BARF World Inc., 23 April 2008. Web. 11 March 2013. “Low Protein Recipes.” National Kidney Foundation. National Kidney Foundation Inc., n.d. Web. 11 March 2013. Mueller, Robert. “Why All The Kidney Problems?” BARF World Blog. BARF World Inc., 6 May 2009. Web. 11 March 2013. Shakeshaft, Jordan. “What’s Actually In Your Tap Water.” Greatist.com. Greatist, 25 April 2012. Web. 11 March 2013. Strauss, Mary. “Supplements Recommended For Dogs With Kidney Disease.” Dog Aware. Mary Straus, n.d. Web. 11 March 2013. Amber Keiper is the Marketing Assistant and Raw Diet Educator for BARF World Inc.. She and her husband have two former rescue animals that are now healthy and proud “BARF brats” – a terrier mix named Chewbacca (“Chewy”) and a tabby mix named Chiquita (“Chiqui”). For more articles like these and to learn more about the benefits of raw food for your pets, sign up for The Intelligent Pet monthly e-zine at www.barfworld.com. Question: It’s my understanding that bison don’t get cancer nor is their meat associated with causing cancer in dogs. Is that your understanding too? Answer: This is a fabulous question! Most of the answer lies in how the bison are reared vs. how the rest of our common food animals are reared. Bison are relatively untouched by humans. We haven’t vaccinated them, we don’t feed them excessive amounts of high-energy foods to force rapid growth, and we haven’t spent decades altering their genetics to make their meat a “better” product (based on someone’s definition of “better”). Because bison are pasture-fed, their meat is much higher in omega-3 fatty acids, and low in omega-6 (which we discussed last month). Therefore, their meat is much less inflammatory than many other types of meat on the market. Inflammation is the key to causing cancer; avoiding inflammation substantially helps someone (human or canine) avoid cancer. Now, get enough people demanding Bison meat and someone, somewhere will figure out how to make more bison faster (think of the recent “super” salmon that, due to genetic engineering, mature in 18 months instead of the standard 36). When that happens, our once healthy food source will become adulterated. At that point, I suspect we will find cancer in bison and we will find the meat will become increasingly tumorigenic for those who eat it. Even polar bears now have cancer simply due to human influence on their environment. Dr. Cathy Alinovi, DVM – veterinarian, pet lover, and nationally celebrated author knew she wanted to be an animal doctor since she was nine years old. Her mission then was simple: to make the world safe for dogs; and her mission now — healthy patients! Dr. Cathy is certified in Veterinary Food Therapy, Veterinary Acupuncture, Chinese Herbal Therapy, and Aromatherapy. Dr. Cathy’s approach provides whole body support through both the best in veterinary medicine as well as high-quality, all-natural foods, supplements, and health care products. Hoofstock Veterinary Service and Hoopeston Veterinary Service are both owned and operated by Dr. Cathy Alinovi. To schedule an office appointment or phone consultation, call (765) 714-5973 or visit www.hoofstockvet.com. Why All The Kidney Problems? Is Your Dog Dehydrated??? Can Lead To Medical Problems!!! Brilliant reading and a ‘rain check’ on those vets that tell you it’s not good buy our processed food (which they profit from in more ways than one!!!!) – we have fed our dogs a raw diet for the past 5 years. We have Billy a Lab who’s 13.5 yrs who did suffer with seizures but STOPPED once on the raw diet. Poppy a 16/17 yr old terrier cross (very fit) and Alfie 1.5 yrs always been on the raw. They are all a picture of health. Thanks Lisa! Feel free to send us a photo of your dogs! We would love to post them on our Social Media Sites. I live in the Brooklyn, NY area and my dog ( 11 year old Pom) was recently diagnosed with mild kidney disease. I have been trying frantically to find a stable diet for him. Can BARF help? While it’s a shame that your dog has been diagnosed with the disease, it’s good that you’ve caught it in it’s early stages as it will make a great difference when switching him to BARF. At 11 years old, he still has some good years left in him if you can convert him over to raw sooner rather than later. Give our office a call (1-866-282-2273) and we’ll provide you and your pooch with a complimentary nutritional assessment and action plan. Hope to hear from you soon! Valuable info. Fortunate me I discovered your site by chance, and I am shocked why this twist of fate didn’t happened in advance! I have a Persian cat and I find him having trouble with the way he pees. I give immediate treatment and I’ll be bringing him to a vet. Could this be kidney problem for my cat? Thanks a lot. Hi Alice. It may be a blockage of the urinary tract. This is quite common in male cats fed dry food. I’d recommend you take your cat to the veterinary to be sure. One good thing about the BARF raw food diet for dogs and cats is that it helps to naturally balance the pH level in the urine to prevent urinary crystals from forming. Once your vet diagnoses your cat, you should definitely consider switching him to a natural, raw food diet. Best of luck! Thanks for the feedback. We’ll have our tech team look into this! to obtain data concerning my presentation subject, which i am going to present in college. Hi Alice, Last week I rushed my precious baby Sammie to the vet because he began vomiting water with red blood in it. I was told he had eat something and was bleeding from straining so hard from trying to make himself vomit. He was give a shot and sent home with 4 tablets of cerenia. He felt a little better for 2 days but them became sicker. I felt like something was not right so I took him to a vet I used years ago with. To find out Sam was very very sick. His BUN was 55 mg/dl, his CREA was 3.5 mg/dl. Then his AMYL was 2196 U/L and LYPA was 2973 U/L. Now he is very sick his kidneys are large his liver is large . We can’t treat his arthritis or allergies anymore. The vet isn’t sure we can even save him. This little guy isn’t just my pet he is our baby. Sammie is a white min. schnauzer. He is 7yrs. Old. We rescued him from a family that treated him badly 6 yrs. ago. I have health issues that keep my home and inside 90 per cent of the time. How hard is it to reverse this damage. This little guy does everything we do even rides the mower when I do. Goes very where we go. Is this common for this breed. What treats can I make from him that are safe. Thank you for listening. I’ve set in the recliner all night holding him for the second night, so I’m tire sorry for rambleing on. Safe: Kidney Disease In Dogs and Cats < Liked it! Exceplent article. I certainly love this site. Stick with it! Keep up the good work! You already know, a lot of individuals are searching round for this info, you can help them greatly. My one-year old neutered mongrel was diagnosed kidney disease before her 1st birthday. I adopted her when she was 6 months old, she was given barf diet. I took her to the vet when I found her wetting the bed thinking that might be from urinary tract problems, but turned out that her urea/crea/bun level were high, the vet took an ultrasound for her and confirmed that her kidneys were quite abnormal. She is now taking k/d prescription diet, with supplements like Azodyl, Rubenal 300, Calcitriol, Renakare, Silox as well as krill oil capsules, vitamin B complex and vitamin C daily. As the indexes and ultrasound images showed that she is in phase 3 of CKD, she doesn’t show any symptoms of discomfort as of yet. I am wondering if it’s a good idea to change it back to barf wellbeing, but is Wellbeing a low phosphorous diet? My 15 year old lhasa-poo was recently diagnosed with Chronic Kidney Failure. Along with Epakitin and 6 weekly shots of ‘fluids’, her vet prescribed a canned food made by Purina, I believe, which is specifically for dogs with kidney disease. I was shocked, when I got home and read the ingredients on the stuff. There is a lot of ‘by product meal’ in it. I never trusted the brand Purina to begin with, but that is what the vet said to feed her, so… I came home with 2 cases of it. In the future, with any future pets, I will be sure to search out a homeopathic/holistic vet. There aren’t many of them out there, but I would travel a bit if I had to. How I wish to win for my puppy Kaka. I think this would really help me monitor her condition. Glad we could help. Are you currently feeding a raw diet to your pup Kaka? I have a 13.5 yo Shetland Sheepdog who has just been diagnosed with fairly early kidney disease. I am wanting to feed him a raw diet (my other Sheltie is fed raw) that is low in phosphorus. I understand that organ meat (liver?) and bones are high in phosphorus. He has been on a cooked/dehydrated raw diet since I got him with ground eggshells as his calcium source and I recently introduced raw green tripe. My concern is giving him enough nutrition that is low phosphorus. My head is spinning at the moment! It seems that everything I consider is too high in phosphorus.